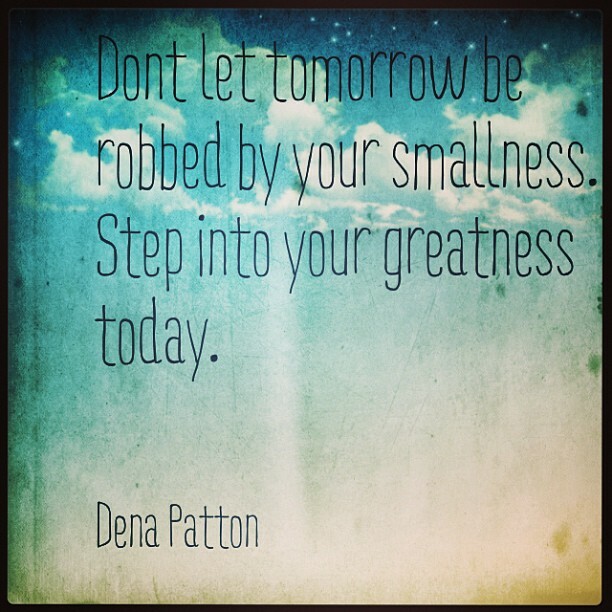 Today is the time to stop believing your smallness. Just the other day I overheard two women who were clearly in their smallness and it just broke my heart. I want to scream from the mountain tops ‘STOP BELIEVING YOUR SMALLNESS LADIES!’. I can get sad very quickly thinking of all the years I spent in my smallness it’s like time was robbed from me. But I’m grateful for the years I’ve been living from my greatness and even more grateful for the women I get to support who are now living in their greatness. See we have two voices in our heads, smallness and greatness. It’s up to us which one we listen to in every minute of every day. When you have a ‘smallness attack’, simply take a breath and push ‘play’ on your greatness voice and let it play for a few minutes until you can find your center again. Then take steps forward coming from your greatness. Everything you say and do is either from your smallness or greatness and the GOOD news is: you get to choose! Start today.